How the power of place brings people together of all viewpoints and beliefs to discuss and debate. This of course is not a new idea, the Ancient Romans and Greeks used their forums and agoras as centres of artistic, spiritual and political life in their cities. The gathering of citizens in an accessible public arena was vital for disseminating political and philosophical ideas and in creating the roots of democracy. In this case the arena was ICC Belfast, the rebranded International Convention Centre, formerly Belfast Waterfront. Looking around the conference centre, it was interesting to see the reaction of delegates to the topics and opinions which were discussed. The event had attracted well over 1500 delegates. However, I was struck by a thought about how the place facilitated this process – the actual procedure of ‘people power’ – without a resource such as ICC Belfast, the potential for events of this size would be severely constrained. I was struck by a thought about how the place facilitated this process – the actual procedure of ‘people power’ – without a resource such as ICC Belfast, the potential for events of this size would be severely constrained. The ‘placemaker’ in me will always ponder that when creating or upgrading our buildings or cities we cannot do so without having a deep understanding of how people will use them. 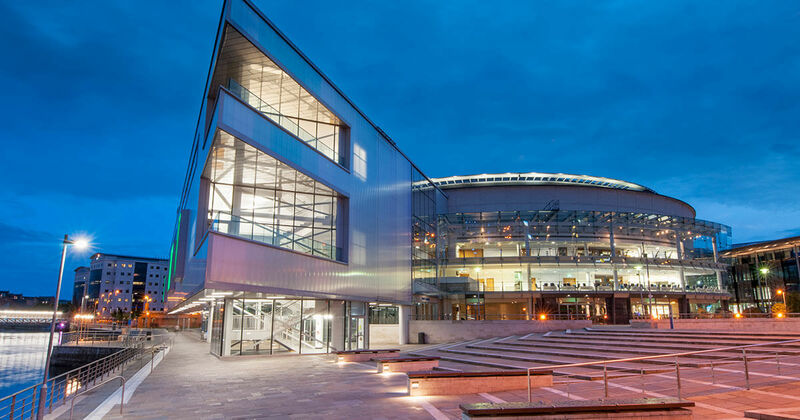 ICC Belfast was expanded in recent years to provide a 2000-seater convention centre to the original Waterfront Hall, which was conceived in 1997, as a place for the people of Belfast to come together and most importantly as a sign of the city’s regeneration. If the recent event I attended is anything to go by the place is doing its job and doing it well, both functionally and symbolically. Indeed, having spoken to several delegates and speakers it was clear that this place fully complemented the purpose of the gathering. For some in the audience the scale of the space was symbolic, as it allowed a large cross-section of people to come together and as the conference progressed there was a palpable feeling in the air and amongst the audience that something truly special was taking place. The ‘placemaker’ in me will always ponder that when creating or upgrading our buildings or cities we cannot do so without having a deep understanding of how people will use them. Symbolism is very important for Belfast. According to the architects RMI, the purpose of the Waterfront Hall was to reconnect the city with the river Lagan and to provoke regeneration. It was designed to draw people into this new neutral space into what was then a very divided city. I also have a personal interest since I’m currently involved in putting another long disused part of the city, the old Sirocco site, back to work. The development of Waterfront Hall and ICC Belfast provides a useful blueprint for our project The Waterside Belfast and we could learn much from this example, as we also plan to play our part in re-connecting the city. I couldn’t help but think that it was all was made possible by the place that is ICC Belfast. It also reinforced for me that the people of this remarkable city have a lot of untapped potential and it’s one that underpins my wishes for the city – Be Brilliant Belfast. Chris Kane is non-executive chairman of Osborne+Co. He is London-based and focuses on the workplace, corporate real estate and change. Over the last 20 years he has been trusted to guide enterprises through challenging transformation journeys, ultimately delivering significant business value by harnessing Smart Value thinking and the benefits of new ways of working.